Vegetables and I are not exactly soulmates. When I’m hungry I don’t instinctively long for broccoli or any of its cousins. I have to plan, set goals*, and regularly remind myself of how good I feel after I eat the vegetables. Let’s not even start on how undeservedly virtuous I feel when I’ve added a healthy dose of greens to my post-workout smoothie. Oh yes, I pat myself heartily on the back when I act like an adult and actually eat my veggies. In my world, one of the best tricks to get me to perform this grown-up responsibility (aside from adding bacon or butter) is to make it convenient. Enter the leafy green purée. My grocery stores give the option of buying spinach or kale in clamshells or plastic bags or in super large bunches. Even if the produce in the clamshells or plastic bags didn’t smell faintly of death upon opening, all of the options are too much greenery for one person to eat before things start to wither. 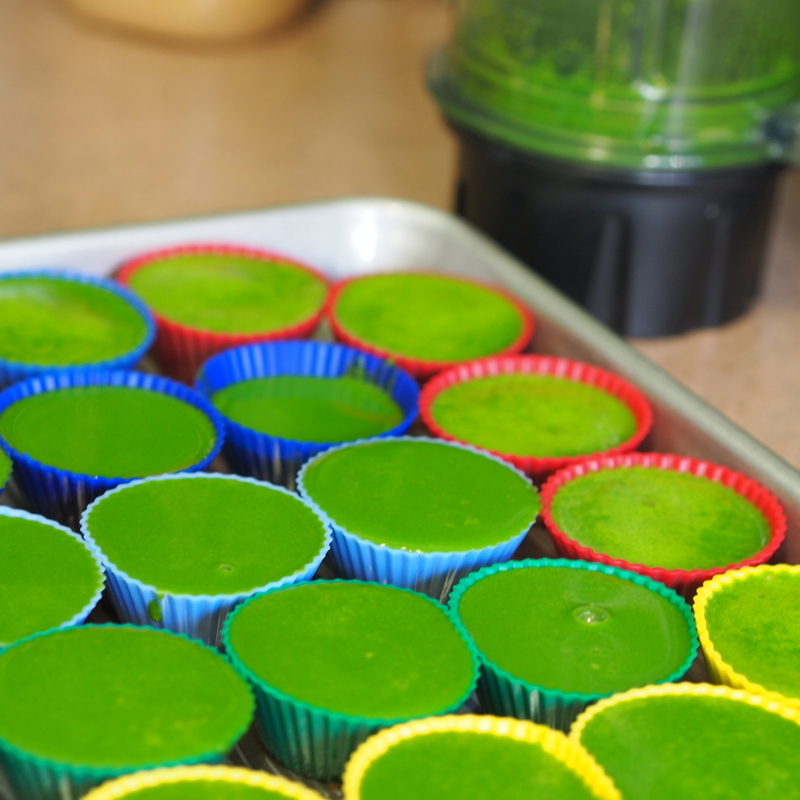 So I purée and freeze them in mini silicone muffin cups. They take up hardly any space in my freezer, I’m no longer feeling guilty about wasted wilted produce, and they conveniently sit right next to the frozen bananas also intended for a smoothie. A couple of mini muffin’s worth of greens is plenty to earn me a vegetable pat on the back for the day. This doesn’t exactly rate as a recipe, but it is one of my favorite kitchen tricks. Stay tuned for a soup recipe that makes use of the frozen greens. Combine all ingredients in your food processor or blender. Process until as smooth as you like. Pour into cups. Freeze. Once frozen, I prefer to remove the purée from the cups and store them loosely in a Ziploc bag. Alternatively, throw a can of coconut milk in with or instead of the water. *Currently, my vegetable goal is at least one daily serving of leafy greens, at least one daily serving of a red or orange vegetable, and at least one daily serving of legumes. And yes, it takes painful amounts of self-control to meet this goal.